"The goods" means the article, things or items described in the order. The Seller requires an annual minimum spend of £4,000.00 on all Trade Accounts. Accounts that fall below this value will be reviewed at the end of the year. Please note when you place an order for items that are in stock, the stock will automatically be allocated to you and held for a maximum of 5 days. Orders placed for items that are out of stock may be kept on record on your Fifty One Percent Ltd trade account, and the items will then be ordered in for you. We may occasionally alter or slightly change the design of items. We cannot accept these as faults. We reserve the right to change specification without prior notice. All new Buyers are required to pay their first three orders on a pro-forma basis by either cash, debit/credit card, cheque, PayPal or bankers draft (unless prior arrangement has been agreed with the Seller). After this time a credit application form may be requested by the customer and a credit account be arranged. All accounts will be credit checked by a third party insurer and references given by the customer will be followed up. In the event of a returned cheque, future transactions may be conducted on a proforma basis only and any charges will be passed on to the customer. Banker’s details and swift transfer details are available on request.  Fifty One Percent Ltd may reduce any credit limit offered if regular late payments are made. All stock remains the property of Fifty One Percent until all invoices are settled in full. In certain circumstances a deposit may be required to reserve special orders or fast moving lines. The Seller’s minimum invoice value for delivery in England, Wales and Scotland apart from the Highlands is £350 + vat, a £20 carriage surcharge will be added to all invoices between the value of £350 and £749.99 + Vat. The carriage paid value is £750. Highland areas require an invoice value of £1000 + vat. This applies to what the seller considers to be normal outlets/shops within the trade. Deliveries to Southern Ireland will be quoted for prior to delivery. The Buyer must inspect the condition of the goods immediately upon receipt thereof and shall within 48 hours from such inspection give notice via email to the seller of any damaged or discrepancies of goods. If the buyer fails to give such notice the condition of the said goods shall be deemed to be in all respects in accordance with the contract and the buyer shall be bound to accept and pay for the same accordingly. Please ensure the persons unwrapping items are very careful to keep the packaging intact. This is essential in preventing the items being damaged on return. Under no circumstances can we accept returns that do not have their original packaging. The Seller is unable to accept returns for items that have not been delivered by Fifty One Percent Ltd. The Seller will not be held responsible for any damages incurred via third party carriers/couriers. The Seller will not accept items returned for credit (except for manufacturing faults) when the buyer has used a third party carrier to collect or deliver goods. It is recommended that the Buyer ensures any transport companies, collecting or delivering on the Buyer’s behalf, have the necessary insurance in place. Goods are not accepted by the Seller for return from the Buyer without the prior consent of the seller. All delivery notes must be signed and name printed by the Buyer and the driver delivering the order. In the event that the quantity of goods delivered falls short or exceeds the quantity specified on the delivery note, the actual quantity unloaded shall be recorded on the delivery note and countersigned by the Buyer and the driver delivering the goods, who shall also record the quantity delivered on both copies. If goods are to be returned the Buyer must request an uplift in writing within 48 hours of receipt, giving notice to the Seller that the goods (or any part thereof) will be ready for collection, the Seller will arrange for collection on the next available order delivery. The Seller requests that the goods must be returned in the original packaging or packaging of a similar nature for goods with manufacturing faults e.g. bubble wrap and cardboard. All items to be returned must be packaged and ready for uplift when the driver arrives at your business premises. Drivers will refuse to uplift and items that are deemed to be inadequately packaged and a credit will not be raised for any items which have been received in poor packaging. Only two separate attempts will be made to uplift the items. If the items are still not available your uplift request will be cancelled and no credit will be issued. Should the Buyer return the goods at their own cost, the amount will be refunded by the Seller, however the amount will be capped at an amount agreed prior to the goods being returned. All returned goods as subjected to a full Quality Control inspection before any decision regarding refund is made. Fifty One Percent Ltd has the final say on whether an item is defective or not. The value of the refund issued to the Buyer is at the Sellers discretion and each case will be considered on its own merit. When the decision to refund has been made a Credit Note will be issued on your Fifty One Percent Ltd trade account. It is the Sellers policy to comply with the Code of Practice for Traders on price indications issued by the D.T.I Consumer and Competitions Policy Directorate. SRP means Suggested Retail Price. Fifty One Percent Ltd provides minimum suggested selling prices for some of its ranges. The minimum suggested selling prices are intended as guidelines only and MUST NOT be used in any form of promotion, marketing or selling of the products. The SRP MUST NOT be displayed with the selling price or product. SRP can only be used as intended by the Seller/Supplier. Fifty One Percent have the right to offer exclusivity of a brand or range of products to the buyer after agreeing with the buyer the territory area and terms of exclusivity. Fifty One Percent’s standard terms of exclusivity to the buyer includes a quarterly sales order value of £1000 + VAT and/or an annual calendar year sales order turnover value of £4000 +VAT. If the value of quarterly sales drops below £1000 +VAT the Seller reserves the right to remove exclusivity from the Buyer although we would contact the buyer before taking on a new account in the same area. Unless, otherwise agreed in writing by the seller, these conditions supersede any earlier conditions appearing in the seller's catalogue or elsewhere and override any terms and conditions stipulated, incorporated or referred to by the buyer, whether in the order or in any negotiations and all guarantees, warranties or conditions (including any conditions as to quality or fitness for particular purpose) whether express or implied by statute, common law or otherwise are excluded and hereby negated (save where such exclusions are prohibited by the Unfair Contract Terms Act 1977). All Drawings, photographs, illustrations, specifications, performance data, dimensions, weights and the like, whether contained in the contract or made by way of representation, have been provided by the Seller in the belief that they are as accurate as reasonably possible, but they do not constitute a description of the goods, shall not be taken to be representations made by the Seller, and are not warranted to be accurate. The sellers employees and agents have no authority to make any representation, statement or report not contained in or incorporated into the quotation by the seller and the seller shall not be bound by any unauthorised representation, statement or report if the seller adopts any changes in construction, design or specification of its products, the buyer shall accept the product so changed in fulfillment of the order. Contracts are not subject to cancellation without the Seller’s written consent. Where cancellation is accepted, the Seller shall in addition to any express terms of cancellation be entitled to reimbursement of any costs incurred by the seller in connection with the contract. Under no circumstance shall the seller be liable to the buyer for loss of profits or economic loss. The goods shall be at the buyer's risk from the time of delivery to the buyer's premises or to such other premises notified to the seller on the order. (b). The buyer acknowledges that they are in possession of all such goods as bailee for the seller until such time as they become the property of the seller under paragraph 23(a) above. (c). Until the goods become the property of the buyer, the buyer undertakes to store such goods on their own premises separately from their own goods or those of any other person and in a manner which makes them readily identifiable as the sellers goods. (d). The buyers rights to possession of such goods shall cease if they do anything or fail to do anything which would entitle a receiver to take possession of their assets or which would entitle any person to present a petition for the winding up or bankruptcy of the buyer. or domestic use. We cannot accept responsibility if used for contract/commercial purposes.